Nick Keefer (left) packed lobsters bound for China with a co-worker at Maine Coast in York, Maine, in 2015. 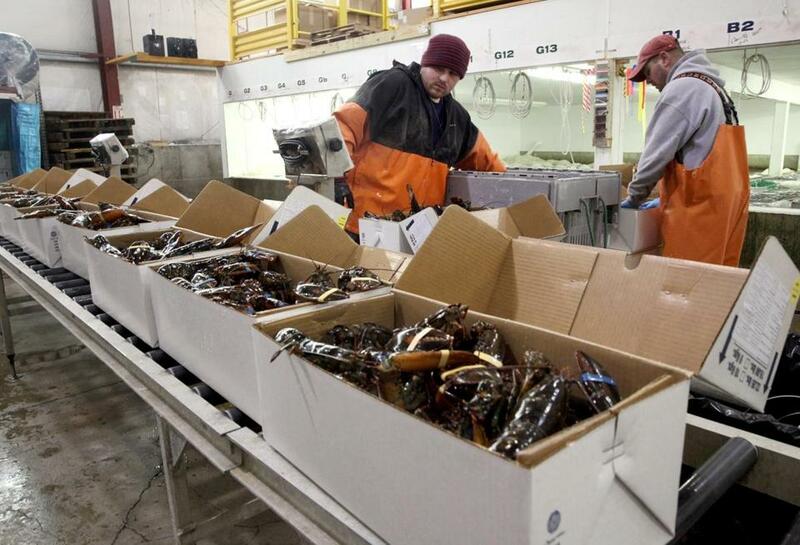 The burgeoning trade war might be hitting local lobstermen after all. Wholesale prices on lobsters — mostly soft shell — have abruptly plummeted in the last two weeks, less than a month after China imposed a 25 percent tariff on US products including the popular crustacean in retaliation for President Trump’s own round of tariffs against Chinese goods. Shore prices — what dealers pay lobstermen for their catch — have dropped to about $3.75 to $3.80 a pound, compared with $5 to $5.25 a pound about two weeks ago, according to several people who work in the lobstering industry. John Drouin, a veteran lobsterman in Cutler, Maine, said he’s selling his new shells for about the same price and selling what’s left of hard shell lobsters at $6.55 a pound as of Monday. “The dealers are dropping the price because of China and we’re getting the hit,” said Cesare Cromosini, a veteran lobsterman in Gloucester. Midsummer normally brings a drop in prices, as the supply turns to softer-shell lobsters that are less desirable than hard shells. But the price decrease is steeper than usual this summer, and many people in the lobster industry blame an oversupply and trade tensions between the United States and China, Canada, and the European Union. Canada struck a recent trade agreement with the European Union that lowered tariffs on lobsters, and that has also boosted sales, probably at the expense of US lobstermen. It’s unclear if and when this would translate into lower prices locally for lobster, a traditional summertime treat in New England. Jo Natale, a spokeswoman for the Wegmans supermarket chain, said costs of lobsters haven’t dropped much and that it is too soon to know the effect of tariffs. Currently, Yankee Lobster Company has Maine soft shell lobsters listed at $6.99 a pound. In June, many US lobster dealers were hopeful that the new tariffs would not be enough to sidetrack China’s huge and growing appetite for the New England staple. Instead, it appears Chinese buyers have begun favoring Canadian lobsters. Rome anticipates shore prices in Gloucester could drop even further, to $3 a pound or less. He said the lowest price he paid last summer was $4.50. Neil Zarella, owner of Boston Lobster Company, is less convinced prices will stay down for the rest of the summer. Meanwhile, Canadian lobster dealers are reaping the benefits. Stewart Lamont, managing director of Tangier Lobster Co. Ltd. in Nova Scotia, said inquiries from China have increased since the tariffs took effect. “We’ve had three or four times more the normal inquiries from mainland China,” Lamont said. Alex Gailey can be reached at alexandra.gailey@globe.com. Follow her on Twitter @alex_gailey.